Sadhak Rāmprasād Sen (Bengali: রামপ্রসাদ সেন; c. 1718 or c. 1723 – c. 1775) was a Hindu Shakta poet and saint of eighteenth century Bengal. His bhakti poems, known as Ramprasadi, are still popular in Bengal—they are usually addressed to the Hindu goddess Kali and written in Bengali. Stories of Ramprasad's life typically include legends and myths mixed with biographical details. Ramprasad is credited with creating a new compositional form that combined the Bengali folk style of Baul music with classical melodies and kirtan. The new style took root in Bengali culture with many poet-composers combining folk and raga-based melodies, mixing every common style of music from classical to semi-classical and folk. His songs are sung today, with a popular collection—Ramprasadi Sangit ("Songs of Ramprasad")—sold at Shakta temples and pithas in Bengal. Ramprasad was born in Halisahar, a village on the banks of the Ganges about thirty-five miles north of Kolkata, into a Tantric Baidya-Brahmin family. Due to the absence of birth records, his actual birth date is not known, but it is believed to be around 1718 or 1723. His father, Ramram Sen, was an Ayurvedic doctor and Sanskrit scholar. Ramprasad's mother Siddheswari was Ramram's second wife. Ramprasad was sent to a Sanskrit tol (school) where he learned Sanskrit grammar, literature, Persian, and Hindi. As a youth, he had a talent for poetry and learning new languages. After returning to his village, Ramprasad spent most of his time in sadhana, meditation, and prayer. Traditional accounts tell of several esoteric sadhanas that he performed, including standing neck-deep in the river Ganges, singing songs to Kali. Ramprasad would regularly practice his sadhana in a panchavati: a grove with five trees—banyan, bael, amalaki, ashoka, and peepul—all regarded as holy in Tantric tradition. He would reportedly spend hours meditating on a panchamundi asana (an altar inside which are interred five skulls–that of a snake, frog, rabbit, fox, and man). According to popular stories he had a vision of Kali in her form of Adyashakti Mahamaya. Raja Krishnachandra of Nadia, a landlord under Nawab Sirajuddaula of Bengal, heard Ramprasad's hymns. Being an ardent devotee of Kali, he appointed Ramprasad as his court poet. Ramprasad rarely attended the Maharaja's court and would spend his time in sadhana and worship of Kali instead. Krishna Chandra became Ramprasad's benefactor, giving him 100 acres (0.40 km2; 0.16 sq mi) of tax free land. Ramprasad, in return, dedicated his book Vidyasundar ("Beautiful Knowledge") to the Maharaja. Krishna Chandra also gave Ramprasad the title Kaviranjana ("Entertainer of poets"). During the Maharaja's last years, Ramprasad stayed beside him, singing hymns to Kali. Ramprasad's mysticism was recognized by sufis and Nawab Sirajuddaula. Ramprasad is said to have visited the court of the Nawab at the Nawab's fervent request. Another popular story is told of Ramprasad's vision of goddess Annapurna of Varanasi. Ramprasad was on his way to the river for his daily ritual bath when a beautiful young woman stopped him, asking if she could hear him sing a devotional song to the Divine Mother. Ramprasad requested her to wait, since it was getting late for his noon worship. When he returned, he couldn't find her, and began to think that it may have been the "play of Divine Mother." Sitting down to meditate, he was surrounded by a radiant light and heard a female voice saying, "I am Annapurna (…) I came all the way from Varanasi to hear your songs but, alas, I had to leave disappointed." Ramprasad was angry with himself and immediately left for Varanasi to find Mother Annapurna and sing for her. After walking many miles, he reached Triveni, where he took rest under a tree on the bank of the Ganges. Here he reportedly received another vision, saw the same mystical light, and heard the Mother's voice saying, "Stay here and sing for me. (…) Varanasi is not the only place where I live; I pervade the whole universe." Ramprasad Sen is regarded as one of the notable figures of the bhakti movement in Bengal during the eighteenth century. He is credited with popularizing the bhakti Shakta tradition and Shyama Sangeet—devotional songs to the goddess Kali. 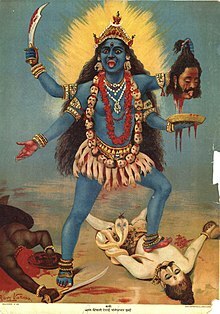 Ramprasad was the first Shakta poet to address Kali with such intimate devotion, and to sing of her as a tender loving mother or even as a little girl. After him, a school of Shakta poets continued the Kali-bhakti tradition. Ramprasad's songs are still popular in Bengal and recited regularly in the worship of Kali. Scholar Shuma Chakrovarty notes that his songs are "broadcast over the radio and sung on the streets and in the homes and temples of Calcutta by a cross-section of people—children, the elderly, housewives, businessmen, scholars, the illiterate, monks, householders, and the youth of all classes". Many of his songs were sung by popular Shyama Sangeet singers like Dhananjay Bhattacharya, Pannalal Bhattacharya, and Anup Ghosal. Still his master literature combination of simple words in the songs melts one's hearts and floods the eye with tears. An [anekanta]vadin reading of Ramprasad's texts is also found. ^ a b Arnold 2000, p. 846. ^ Ayyappapanicker 1997, p. 64. ^ White 2001, p. 168. ^ The Gospel of Sri Ramakrishna, by Swami Nikhilananda, Introduction, p. 13. ^ Monaghan 1999, p. 334. ^ "Eminent Personalities". Govt. of Barrackpur. Retrieved 2009-05-05. A poet, sensitive about his time and his songs are to be heard in practically every rural Bengali home even today. ^ Lipner 1998, p. 261, "Ramprasad Sen, and eighteenth-century Bengali Sakta devotee of Kali who is still popular among his compatriots." Arnold, Alison, ed. (2000). The Garland Encyclopedia of World Music. Taylor & Francis. p. 846. ISBN 978-0-8240-4946-1. Budhanananda, Swami (1994). Ramprasad: The Melodious Mystic. Ramakrishna Mission, New Delhi, India. ISBN 978-81-7505-240-6. Harding, Elizabeth U. (1998). Kali: The Black Goddess of Dakshineswar. Motilal Banarsidass. ISBN 978-81-208-1450-9. Hixon, Lex (1998). Great Swan: Meetings With Ramakrishna. Burdett, N.Y.: Larson Publications. ISBN 978-0-943914-80-0. Martin, Nancy M. (2003). "North Indian Hindi Devotional Literature". In Gavin D. Flood. The Blackwell companion to Hinduism. Wiley-Blackwell. ISBN 978-0-631-21535-6. Mondol, Promothonath (1999). Grace and Mercy in Her Wild Hair : Selected Poems to the Mother Goddess, Ramprasad Sen. Hohm Press, Prescott, Arizona. ISBN 978-0-934252-94-2. Sen, Sukumar (1960). History of Bengali Literature (3 ed.). Sahitya Akademi. ISBN 978-81-7201-107-9.